I signed up rather late this week. On Wednesday I thought, “Oh, yeah, drawing challenge!” And it turns out, our host is my friend Tammie, with the word “swoon”. Oh my gosh, does anyone swoon any more? I sat in my bedroom Thursday morning and thought about swooning, and kept having images of Edwardian ladies in tight corsets. They used to swoon, didn’t they? So I went thru a bunch of supplies and pulled out an old Toile de Jouy curtain panel. You know that material? With the bucolic images of lovely Edwardian life. So I studied it and saw a couple hurrying across a bridge and wondered what they were hurrying away from. Oh! So that’s it! Will you just look at the state of the apple pickers. The youth these days…eh? And, does she have a nose ring? And flaming red hair? Is she smoking a cigarette and wearing a pointy Madonna corset? And does he have blue hair and goatee, and gang tattoos and a huge gold chain? I think so. And is that a longboard?!? And is he handing her a skull?!?!? 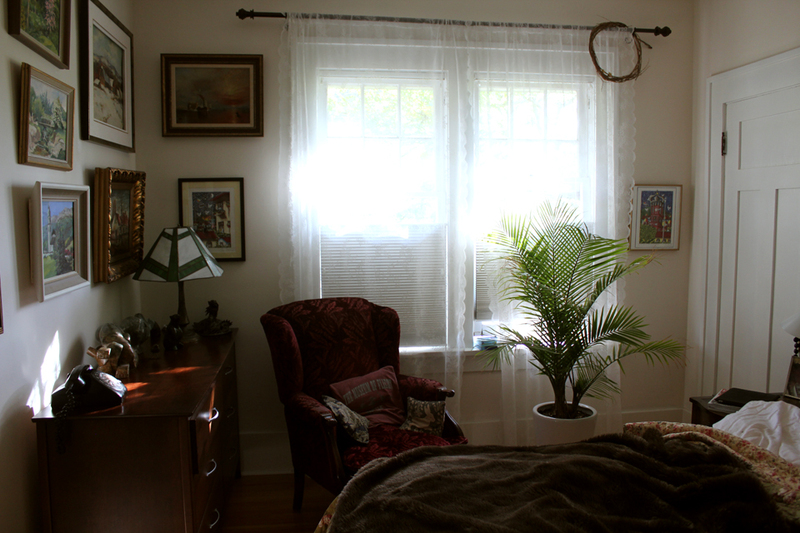 Come hop over to my friend Kelly’s lovely blog Soulful Home when you have a chance. Not only is she a fantastic decorator, she has wonderful DIY ideas. She’s started a Soul Sister Series and I’m being featured as her first soul sister, Isn’t that lovely? And I’ve offered a giveaway of one of my original paintings. Perfect, ha so your swoon girl!!! You did imagine several things and made it your own. Love it, And those colours, they fit perfectly. x Joke. ah, you are so much fun! I love how you brought this tale to life and modernized it! thank you also for joining us! 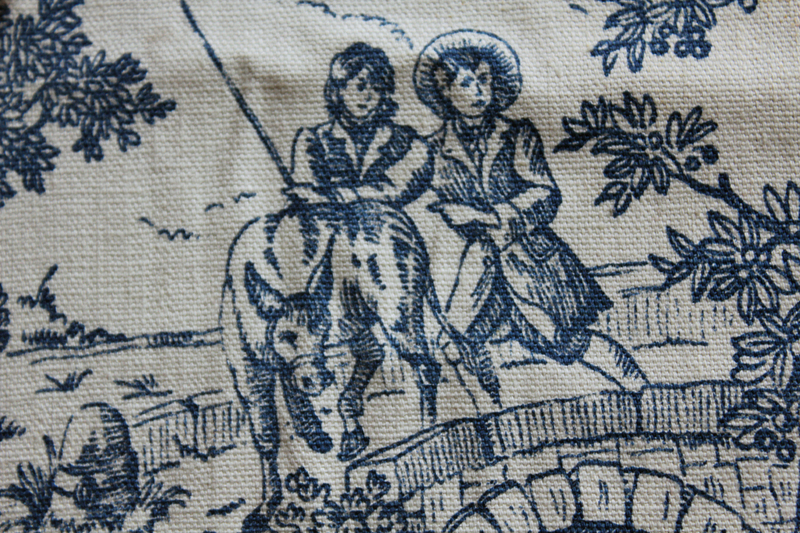 I need to take a second look at some toile that I have in our guest room! No telling what I may see after this! I clicked over from Kelly’s blog. Nice to meet ya! That would be fantastic Jane. 😀 I’d love to see what you come up with. And, way to surprise the guests…lol. Ha ha ha, I love this! 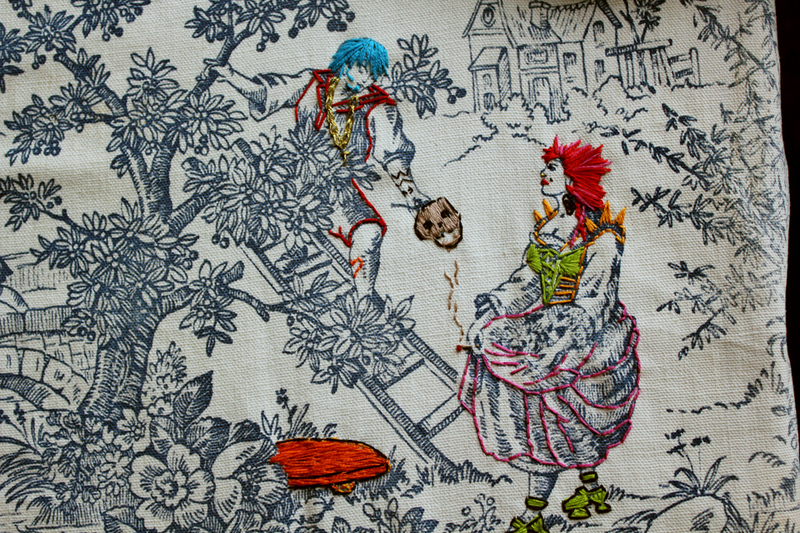 What a great jump to make from swooning to toile to gang tattoos! hee hee hee… you are too funny! such a surprising turn, i really hadn’t expected that. thoughtful, besides cunning… n? 😀 Thank you so much Nadine. Glad it made you smile. Wow…now fabric designer added to your list of accomplishments! Loved/love sharing you with my readers and they loved it too. Who wouldn’t? I definitely like the blue and red hair, so modern and yet not quite. very creative way to change/edit art. What wonderful creativity! Love how you brought that fabric some new life and fun! i have seen it before but don’t remember where or by who….